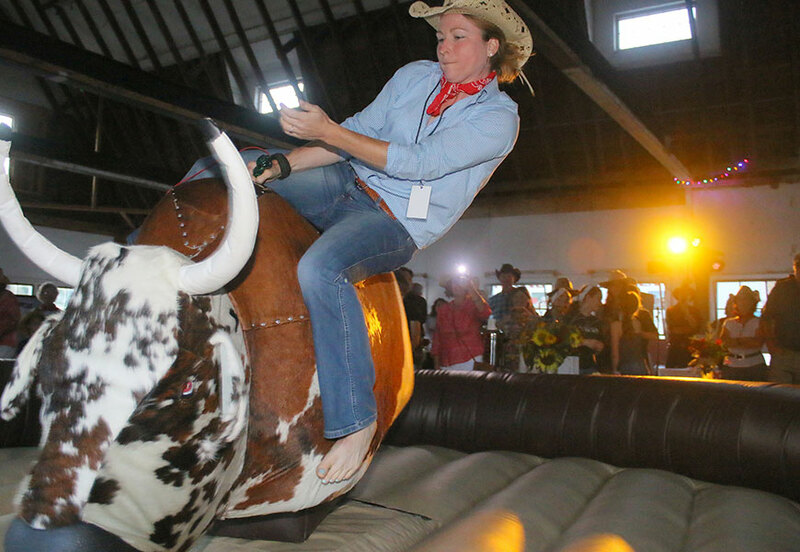 It’s time to get your team together for the 2016 Rai$e the Roof Bull Riding Competition! All proceeds benefit Phase III of the Upwey Barn Roof Project. Each team will have one designated rider. Riders must register below. Each team will have one rider. The bull will be set at the same intensity level for each rider in a given round. A qualified ride is eight seconds. The clock starts when the bull starts to move. It ends when the rider’s hand comes out of the rope, the rider touches the ground, or the rider’s free arm touches the bull (a “slap”). Riders making a qualified ride will advance to the next round, where the intensity of the ride will be increased. Rounds will continue until there’s only one rider left. The winning rider and his/her sponsors will receive prizes. There will be prizes for 1st through 3rd place, and special awards for Most Money raised by a Team, Best Fall and Oldest Rider.